Clathrus archeri is native to Australia and New Zealand although it can be found introduced in forests in Europe and North America (they have been documented specifically at Henry Cowell Redwoods State Park near Santa Cruz). If you see this fungtastic wonder, DO NOT APPROACH. It won’t harm you…well, actually, it could (see below) but we don’t want YOU to harm it. Take a photo, though, to share with rotanical lovers everywhere. According to Kew Royal Botanic Gardens the unexpanded (not yet “hatched”) eggs of stinkhorns are considered a culinary delicacy in some countries but related species to C. ruber, have had reports of poisoning: eczema, convulsions, and sickness are anecdotally said to be the result of handling the Clathrus ruber fungus. The related stinkhorn, Phallus impudicus, has been used to treat wounds (with the dried “dust” or spores) to prevent infection. I love this photo because it has a fly on it! This beauty sports a wide inflorescence, with a somewhat phallic spadix (well, have you met a spadix that isn’t phallic?) which is made up of tiny male and female flowers. 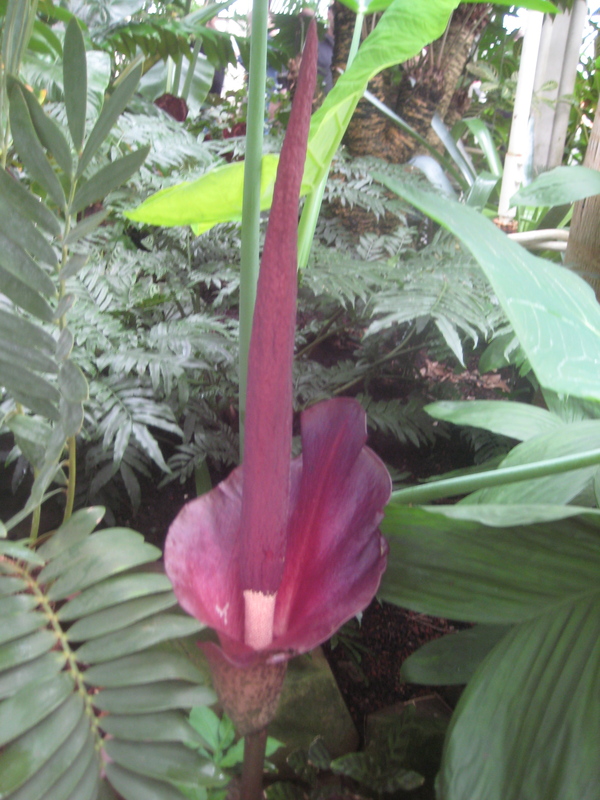 What is referred to as the flower is actually a modified leaf (spathe) plus spadix made up of tiny flowers. The spathe is moddled, usually a rich shade of red but can have some green and even white. 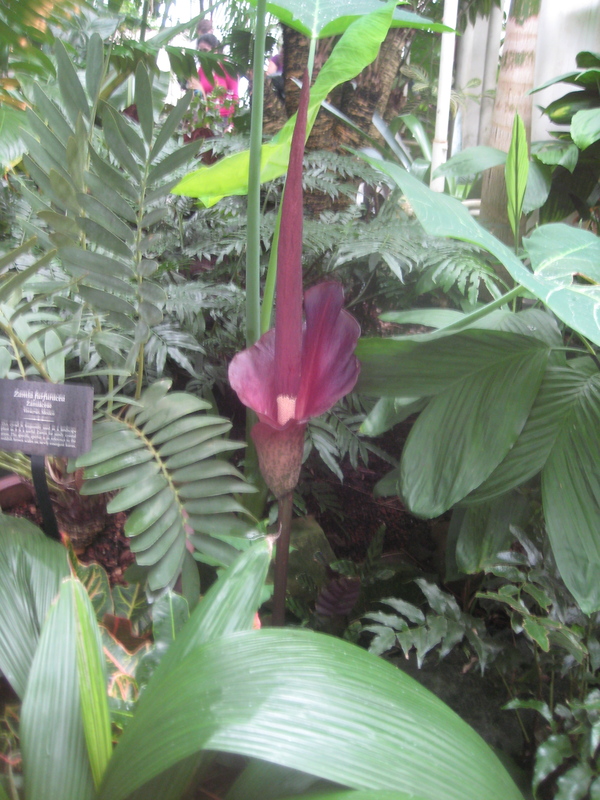 The spadix is typically black or deep maroon. 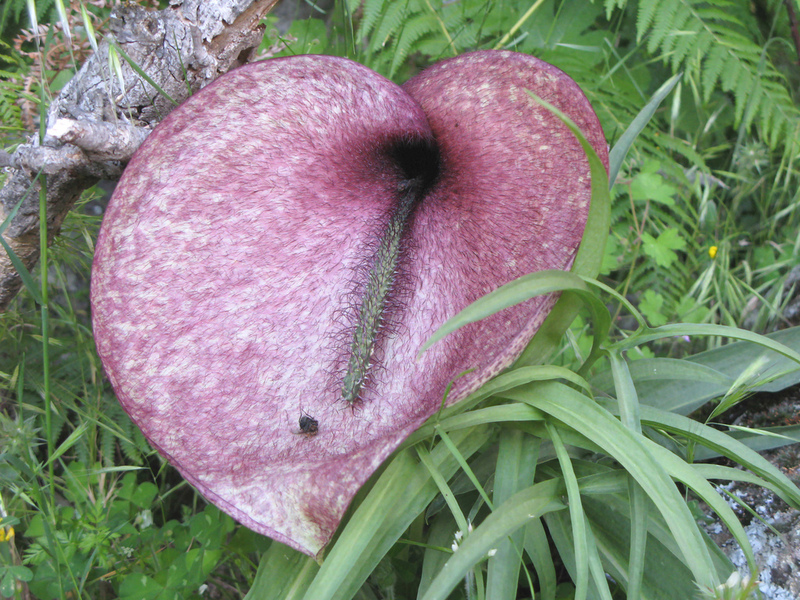 The Dead Horse Arum is also one of a rare group of thermogenic plants. It can raise its own temperature, a handy trick to convince those flies that it really is hot, dead, flesh. How rotten is that? The Corpse Plant does this as well. Incidentally, other plants that are thermogenic include the Elephant Ear philodendron and certain water lilies. Who knew? Similar to other arums or aroids the Dead Horse Arum goes dormant. It is grown from a corm and likes a nice hummus rich soil, does great in containers, and can even withstand a bit of a temperature drop, as long as its buried snugly in a said hummus-y soil. I expect this would do well in most climates if kept in a container and properly mulched/brought into a hot house for the winter. That being said, I’m spoiled in my Mediterranean San Francisco climate and wonder if any of you inlanders, Southerners, or Northern Europeans have any experience growing this savory rotanical? Let us know ! These pretty little flowers almost fool you into thinking this vine can’t stink! 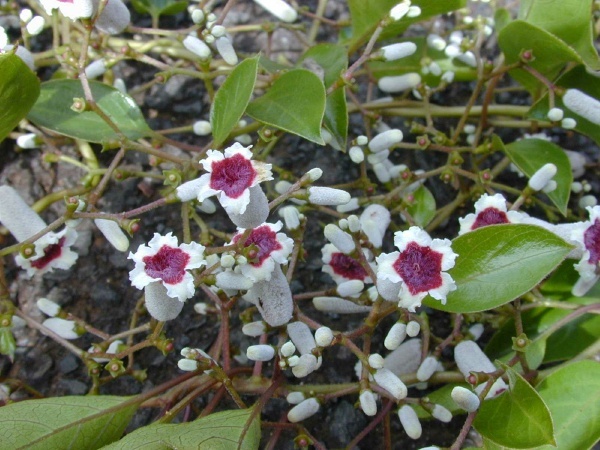 Naturalized in Melanesia, Polynesia and even Hawaii, though it is not native. Considered an invasive weed in Florida and other parts of the Southern United States. It was introduced to the USA as a potential fiber plant in 1897. Oops! Height: To 30 ft. though usually 20 or so. From the looks of this baby you would not believe it stinks to holy hell (though its name would probably have tipped you off) because its delicate bi-colored flowers (white to pale yellow fading to pink/lilac and/or red) look like sweet little tubes of pretty. And that’s part of what makes this perennial, evergreen rotanical even more interesting. It’s flowers, actually, are not the fetid part. 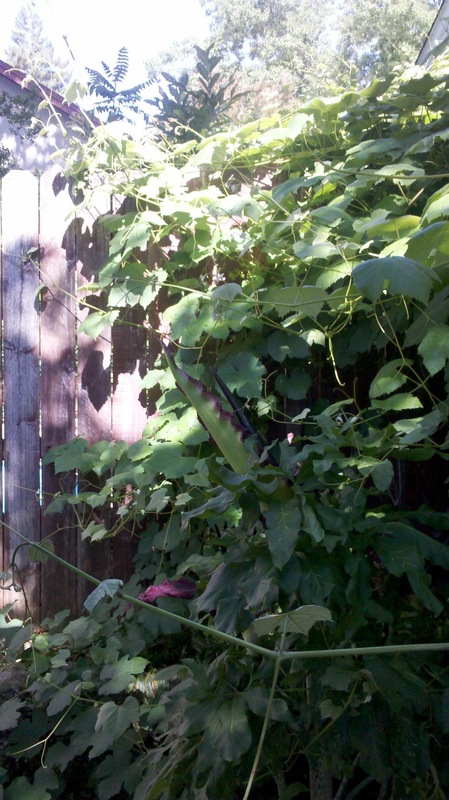 When you crush the leaves of this fantastic plant you get a horrid sulphuric smell, earning its name Stink Vine. The actual oils of the plant contain a sulphur compounds, including dimethyl disulphide. In Hawaii this is the main larval food plant for the Maile Pilau Hornworm, a hummingbird moth. Interestingly, one of its common names Chinese Fever Flower, alludes to its other amazing properties. Ethnobotanically speaking, the Stink Vine and its sulphurous compounds contain a great deal of antioxidants and is used medicinally as an anti-inflammatory, an immune booster, and has even shown potential as an anti-cancer agent. In Indonesia the leaves are traditionally served boiled with rice and sambal, often by street vendors. The leaves are also high in calcium and Vitamin C and very rich in potassium. If you want to read a very nerdy but wonderful study of the Indonesian variety of Paederia foetida, click this link. The most distinguishing feature of the Titan Arum is its distinctive smell. When at last mature enough to produce a full fetid bloom beware! This thing smells like a rotting corpse. Probably more like a rotting carcass, like that of a dead whale or seal on a beach, than an actual human corpse, its foul smell also attracts visitors to whatever botanical garden is hosting the stink-party. I was a docent at the Conservatory of Flowers back in 2005 when Ted the Titan, on loan from the UC Davis Botanical Gardens, bloomed in all its funky glory. People were lined up out the door of the Victorian conservatory just to get a glimpse, or in this case, a whiff. It is truly a sight to behold. The flower looks like a giant version of the Voodoo or Vampire lily, with a massive spadix jutting out of its delicately ruffled outer petals. It has a blood-red interior and a green outer layer, often streaked with color like dripping blood! The cultivation of such a plant is only recommended for individuals with very strong stomachs, decent biceps and good backs, who are also in possession of a very, very large hothouse. 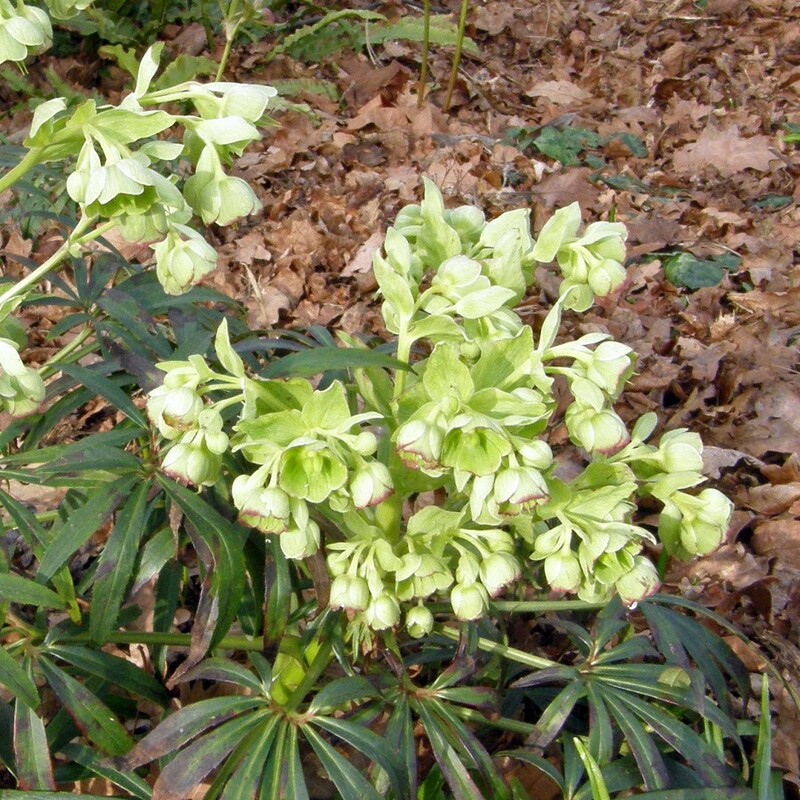 It is native to Sumatra and does not like cold temperatures. The tuber alone on a mature plant can be over forty pounds! Requires warm temperatures, extremely high humidity. Even when dormant, do not expose to temperatures lower than 59 degrees. 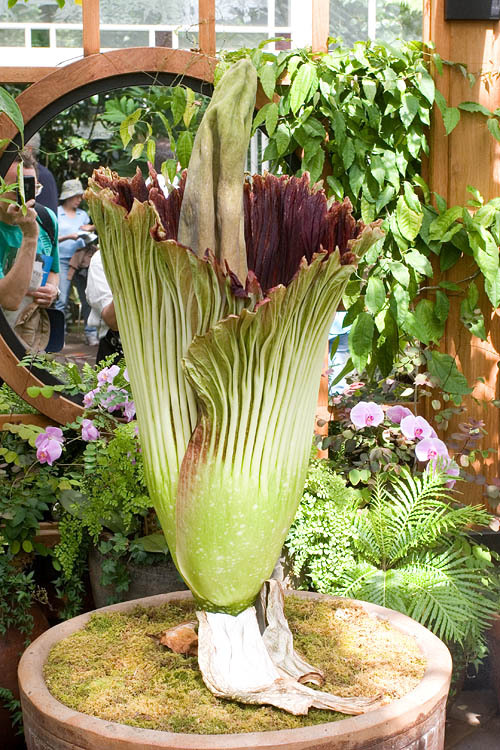 This is Ted the Titan from the 2005 bloom at the SF Conservatory of Flowers. 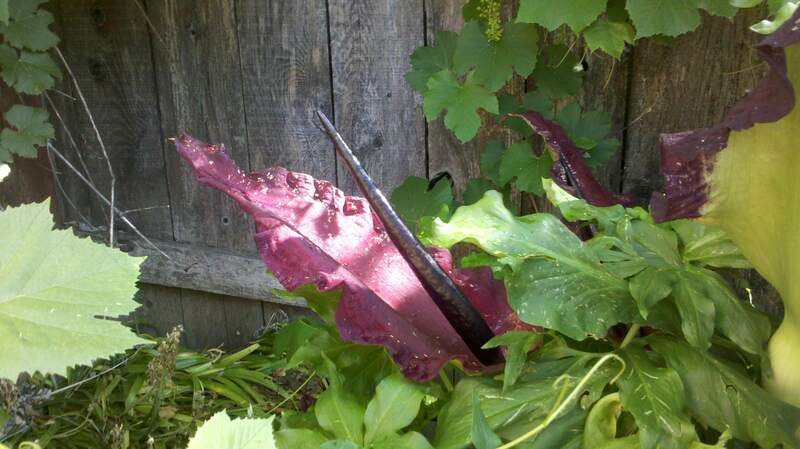 No rotten garden is complete without the beloved Vampire Lily, Dracunculus vulgaris. Also called the Dragon Arum, it is in the Araceae family along with the Black Calla, and sports one of the finest botanical names in the whole rotten world! 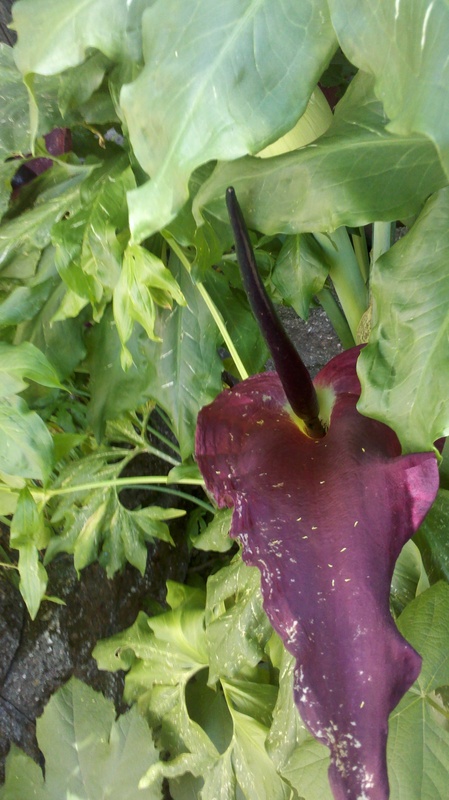 Similar in appearance to the Black Calla and more so, the Voodoo Lily, the Vampire Lily produces multiple green stems that appeart to be splattered with blood. 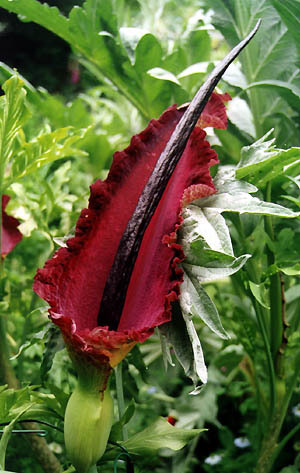 Its flower is a deep dark red and has a ruffled edge, and the spadix is long, blackish purple, and totally evil. Not unlike its Voodoo cousin its fading flower emits a smell like that of rotting flesh, designed to attract flies and carrion beetles that pollinate it. Full sun in mild climates, partial shade in hotter climates. Regular water, mulch only in coldest climates. Thrives on neglect. Do not over fertilize. Native to Mediterranean Europe. Which happens to have some other super cool plants that I love, like the Corpse Plant. I will get into that later.